This full-body workout will challenge you, yet it’s short enough to fit into a busy travel schedule. Enjoy a highly creative, energizing and fun workout involving multiple body positions with Leah Stewart on the Reformer Trapeze Combo (RTC). Whether you are new to Pilates, or more seasoned, Leah's precise cueing and coaching will help you through the workout with confidence. Achieve a whole body integrated experience and finish this workout feeling stronger and longer! Leah gives you an awesome injury prevention workout for the lower body. 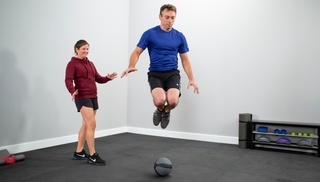 Focussing on alignment and biomechanics through strength and power, as well as core integration and mobility, you'll get a great ideas on how to stay injury free in your activities of daily life as well as athletic endeavors. Start with Lisa and Jeannette as they take you through some push through bar mobility in this workout. She then moves you onto integrating the tower with the reformer carriage by use of the yellow springs for a variety of body positions and goals! If you'd like a whole body workout which integrates both the reformer and the tower, this video is for you! Ana Caban takes you through a fantastic introduction on the Contrology reformer variations, the benefits and differences to this incredible piece of equipment. Get your questions answered and then take yourself through a Classical order Pilates workout with Ana as she guides you to the unique ways to use the springs, work harder and challenge the whole body. Would you like to know and learn more about the Guillotine Tower from a great resource? This video with Kyria is definitely a must watch for you. Understand this piece of equipment, its benefits, along with a series and collection of exercises to get you started and inspired for more. Own a Ped-o-Pull and want a wonderful introduction of how to utilize this piece of equipment, its benefits as more? Kyria gives great information and instruction along with a variety of exercises and ideas on ways to best use. Kyria gives you a great collection of ways to use the "lonely ladder barrel" in your studio. Join her as she takes you through options to use this fantastic and effective piece of equipment as part of your Pilates sessions. Let your ladder barrel be lonely no more with these exercises! 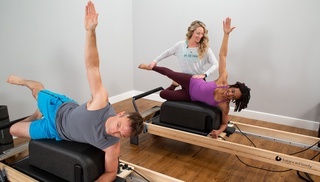 Get a great introduction on the Rialto reformer with Christine! 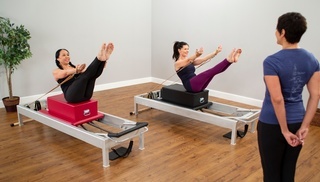 She guides you on the user friendly features of this reformer and then takes you into a wonderful full bodied workout using the sitting box lite, which comes with the Rialto reformer. See how a Balanced Body Reformer is made in this short video. Mette Hansen takes you through a wonderful introductory workout on this dynamic product, the Oov! Notice how many exercises you might perform regularly can feel entirely different when you add in this piece of equipment. Challenge your core, mobility and stability the entire time! Join Mette Hansen in this fantastic full bodied workout on the reformer. You'll combine traditional reformer exercises with the Balanced Body Konnector. Notice how the body will need to shift and change depending on the use of the straps and how you will gain the opportunity to work into 4 way movement strategies!